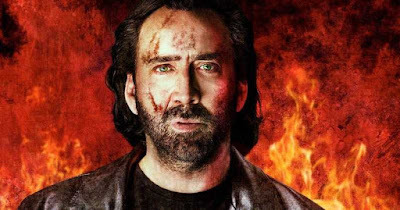 After the 1-2 punch of Mandy and Mom & Dad, Nicolas Cage has sorta slipped back into mediocrity. However, the movies he's choosing are getting crazier, and that certainly applies to Jiu Jitsu, a sci-fi martial arts flick that sees him battling an alien who returns to Earth every few years spoiling for a fight. The film comes from writer/director Dimitri Logothetis, who absolutely killed it with the recent Kickboxer reboots. He should be perfect for this film which is based on his own comic book. Logothetis will reteam with Kickboxer star Alain Moussi who plays a Jiu Jitsu fighter who must defeat Brax, an alien invader who comes to Earth every six years. Cage's role is that of someone who aids in the fight against Brax. Jake McCall is a combat vet who now works as an assistant wrestling coach for a small college whose major claim is its wrestling team. He is married to a beautiful, caring wife and has a precocious five-year-old boy, and his life with them in a peaceful college town is idyllic (perfect outcome for a combat vet with PTSD). Or so he believes. Long ago, floating particles from outer space took forms in human brains and have controlled human bodies by altering MEMORIES. A violent world-takeover now looms, an apocalyptic day that has been set for over a century. The players in this multi-generational plan are known only to each other, and only at certain times. Jake McCall is at the center of the resistance to this plan, the lynchpin of the whole operation. And he has no idea. The aliens have taken him, cloaked his brain with an array of false memories and perceptions, and robbed his life of the one thing he needs to save the world.